Kaspersky Antivirus Free Version for Windows is a lite version of Kaspersky Antivirus pay and offers your computer protection against malware. The Kaspersky Free version has essential system protection features such as file, email and web antivirus; automatic updates, self-defense; quarantine; etc. This free version of Kaspersky Ant-virus ensures convenient and secure web browsing, the use of USB sticks and other portable storage media, as well as protection against phishing and infected files running. In short, the essential basics that no one on the planet should be without. Kaspersky Free is also lighter in system resources and faster than KIS, KAV and Kaspersky Total Security. It is based on the same technologies as Kaspersky's paid security products, which are still on top of independent testing. Although Kaspersky Antivirus Free Version provides bare essentials, it's still a punch. Kaspersky Free does not present all the usual nonsense such as the tracking of user habits and advertising-related privacy violations - which Free AV generally suffers to make it financially attractive to its manufacturers. 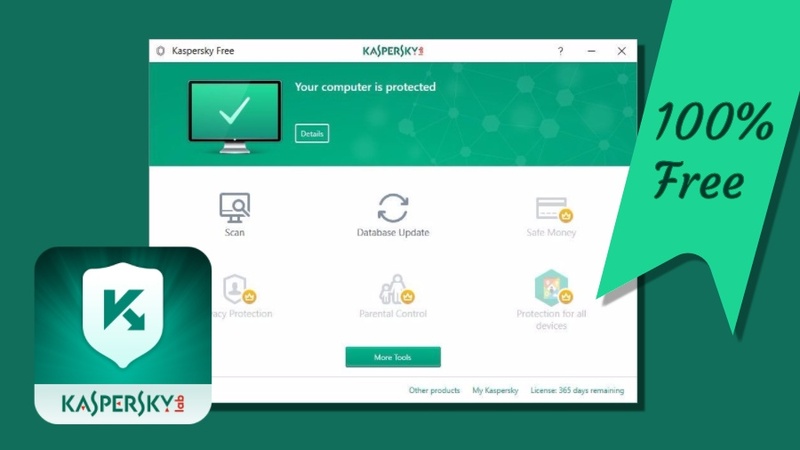 Kaspersky Free is designed to protect your computer against malicious programs. Each threat type is managed by a corresponding application component. Enable and disable the components independently to configure the application. Antivirus Files, which protects the file system of the computer. Antivirus Mail, which checks for viruses and other malicious programs in incoming and outgoing email. Web Anti-Virus, which intercepts and blocks website scripts if they threaten your computer. If Web Anti-Virus is enabled, all traffic is controlled and dangerous websites are automatically blocked. Anti-Virus IM, which maintains security when using instant messaging applications. Anti-phishing, which checks if web addresses are on the list of phishing websites. Visual keyboard, which prevents criminals from intercepting information entered by the user with a standard external keyboard. It is now possible to parse scripts using the AMSI interface (Antimalware Scan Interface). AMSI is a standard Microsoft interface for parsing scripts and other objects. The component can only detect a threat and report it, but it does not handle threats. The component is available in Microsoft Windows 10 or later. The analysis of encrypted connections has been improved. You can now choose actions for sites that returned scan errors and add those sites to exclusions. It is now possible to disable the decryption of EV (Extended Validation) certificates. The Tools window has been improved. Application features are now categorized to help you find specific features faster. The notifications view has been improved. Notifications that are not critical for application performance are not displayed when the user is in full screen mode. The window of recommended settings has been improved. The "Delete potentially infected objects" check box and the "Detect other software that can be used by criminals to damage your computer or personal data" checkbox have been added.